The 2-match Test series between India and The West Indies is just about to commence in few days times, and there have been a lots questions asked regarding the selection and omission of several players in the Indian team. There are plenty of fresh faces in the Indian squad, and the visitors too have brought in an inexperienced team to face the No.1 Test team in the world led by Virat Kohli. While the core players select themselves, there are still questions on who will open with KL Rahul in the first match of the series. Will it be the prodigy Prithvi Shaw, or the ever consistent Mayank Agarwal. Either way, these are exciting and testing times for Indian Cricket as they are looking past Murali Vijay, and Shikhar Dhawan in the red ball Cricket. While all this has been, we will look at the 5 Indian players who make the series their own. The second coming of Jadeja. 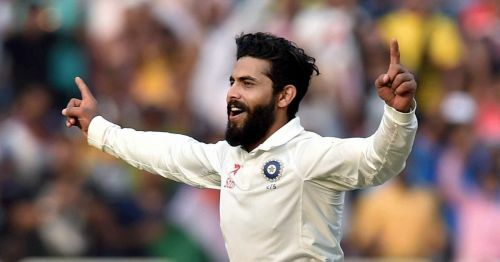 Ravindra Jadeja found a fresh lease of life when he got picked for the Asia Cup on the back of his good performances in the final Test match against England. He got his mojo back with the bat and chipped in with few useful knocks in the Asia Cup. With the surfaces in India assisting spinners, Jadeja is deadly dangerous with the ball and a game changer with the bat on his day. With Ashwin back to full fitness, one can expect them to rattle the West Indies batting order who are weak against spin.